Measures on grocery taxes, supermajority vote requirement and health care restrictions also falling on election night. 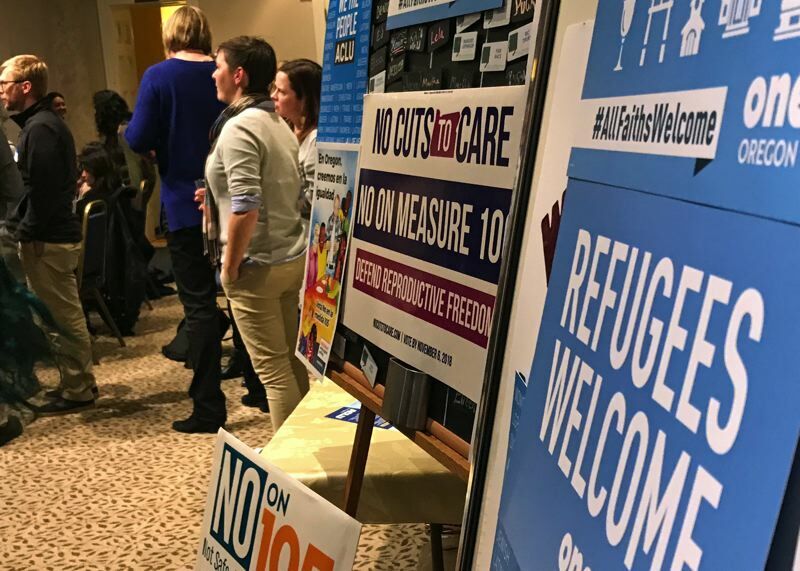 SALEM — Oregonians blocked attempts to overturn the state's sanctuary status for undocumented immigrants and affirmed public funding for reproductive health care, holding onto its status as a socially liberal state. They also roundly rejected fiscally conservative measures that attempted to restrict tax increases, opening the door for broader tax reforms in the 2019 legislative session. In early statewide returns, about 58 percent of voters rejected Measure 103, which would have banned taxes on groceries. And about 66 percent of voters counted rejected Measure 104, which would require a three-fifths majority vote in the Legislature on certain tax-related measures. Under that measure, lawmakers — 60 percent in both the House and Senate — would have had to vote "yes" to approve changes to tax credits, exemptions and deductions, or fee increases. The liberal coalition Our Oregon claimed that the state in this election defended itself from out-of-state interests. "By rejecting Measures 103 and 104, Oregonians came together to defend our values from outside special interests who tried to increase their profits at the expense of Oregon families," said Our Oregon Executive Director Becca Uherbelau in a statement. "Voters once again made a statement for all of Oregon's leaders to hear: we want strong investments in health care and education." Proponents of Measure 104 said the measure's complicated ballot title presented an insurmountable challenge. "The complicated and confusing ballot title was just too much to overcome," said Shawn Cleave, government affairs director for the Oregon Association of Realtors, in a statement. "Our coalition will continue to fight to protect important deductions like the mortgage interest and property tax deductions that keep homeownership affordable for many of our friends and neighbors." Measure 105 would have overturned a state law that prohibits local police from using their resources to apprehend people whose only violation of law is being in the country without legal permission. About 63 percent of voters said no. "It reaffirms the feeling that Oregon is a welcoming state," said Levi Herrera-Lopez, executive director of Mano a Mano, a community organization in Salem that primarily serves Latino families. Herrera-Lopez joined many Mano a Mano staff knocking on doors urging people to vote no on the measure. He said the results validate what they heard from voters on the ground. "Us immigrants, we're seen as people who can contribute to the community," he said. "The rhetorical significance of invaders doesn't hold ground here in Oregon." The measure prompted a divide within the state's police community, with 16 largely rural sheriffs supporting the measure. Other police officials spoke out against it publicly, including Multnomah County Sheriff Mike Reese and Deschutes County District Attorney John Hummel. Voters also blocked Measure 106, which was mounted by a pro-life group that wanted to ban public funding for most abortions. About 64 percent of voters rejected Measure 106. Pro-choice advocates were buoyant about the results. "Together, we made sure that Oregon voters saw Measure 106 for what it was: a backdoor ban on abortion," said Grayson Dempsey, executive director of NARAL's Pro-Choice Oregon political action committee. "In Oregon, we trust women to make their own decisions — and a right is not a right if you cannot afford to access it." Amid a statewide housing crisis, Oregonians also approved a measure that allows local governments to use public bond money for private housing projects. Nearly 56 percent of voters approved the measure. "Housing is affecting everybody, whether it's our workers at OHSU who are getting priced out of Portland or workers in Pendleton who are worried about finding housing," said Joe Baessler, political director for Oregon's American Federation of State, County and Municipal Employees, which represents government workers. "It took me by surprise how strongly our members felt about that measure." The measure requires local voters' approval of any such bonds, annual audits and public reporting on how the borrowed funds are spent.